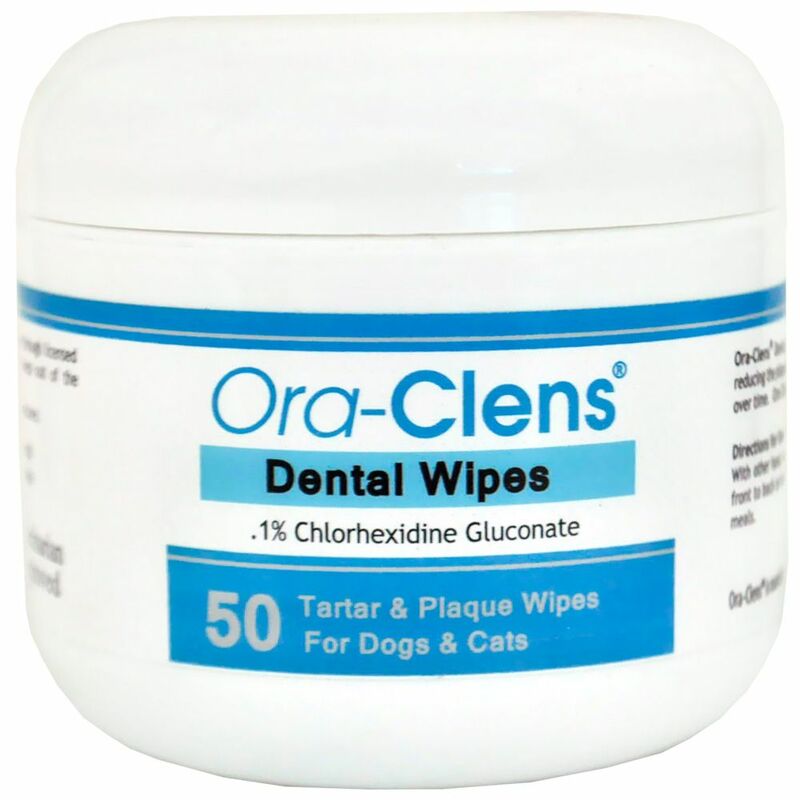 Ora-Clens Tartar & Plaque Wipes An effective and safe dental solution with antimicrobial activities reducing the plaque, dental calculus and tartar buildup on pet's teeth over time. Ora-Clens also reduces bacteria that cause bad breath. Textured Pads Ora-Clens Dental wipes pads are specially textured to assist in removing debris from pet's teeth. It's also great for removing plaque and tartar leaving pet's teeth clean and polished! Ora-Clens Dental Wipes Active Ingredient 1% Chlorhexidine Gluconate - This active ingredient is an effective antiseptic, helps to reduce dental plaque and oral bacteria which causes bad breath. 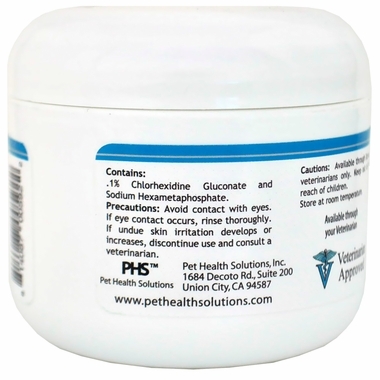 Sodium Hexametaphosphate - This active ingredient effectively fights stain and tartar build-up. Ease of Use With one hand, lift your pet's lip over the teeth. 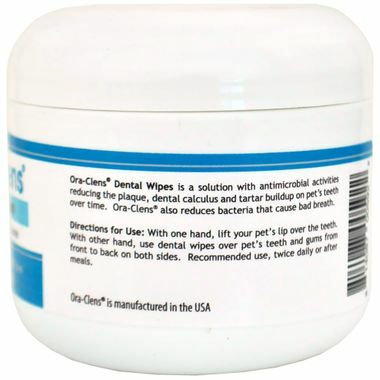 With other hand, use dental wipes over pet's teeth and gums from front to back on both sides. Recommended use, twice daily or after meals. Precautions: Avoid contact with eyes. If eye contact occurs, rinse thoroughly. 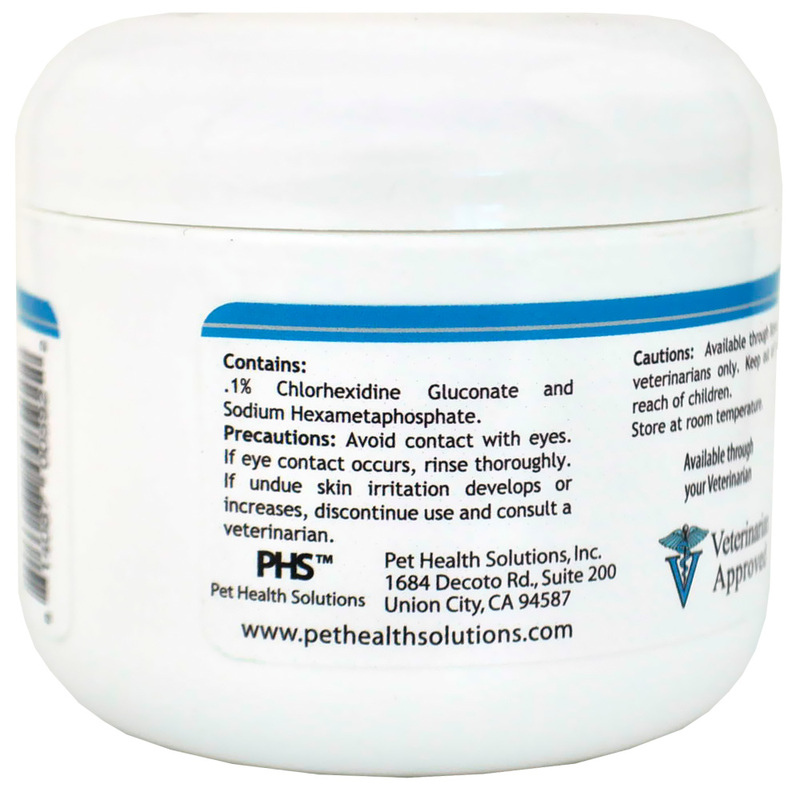 If undue skin irritation develops or increases, discontinue use and consult a veterinarian. Cautions: Available through licensed veterinarians only. Keep out of the reach of children. Store at room temperature. For Dogs & Cats of All Ages! Water Glycerine, Propylene Glycol, Polysorbate 80, Methylparaben, Sodium Bicarbonate, Propylparaben, Potassium Sorbate, Mentha Piperita (Peppermint) Oil, Mentha Viridis (Spearmint) Leaf Oil. With one hand, lift your pet's lip over the teeth. 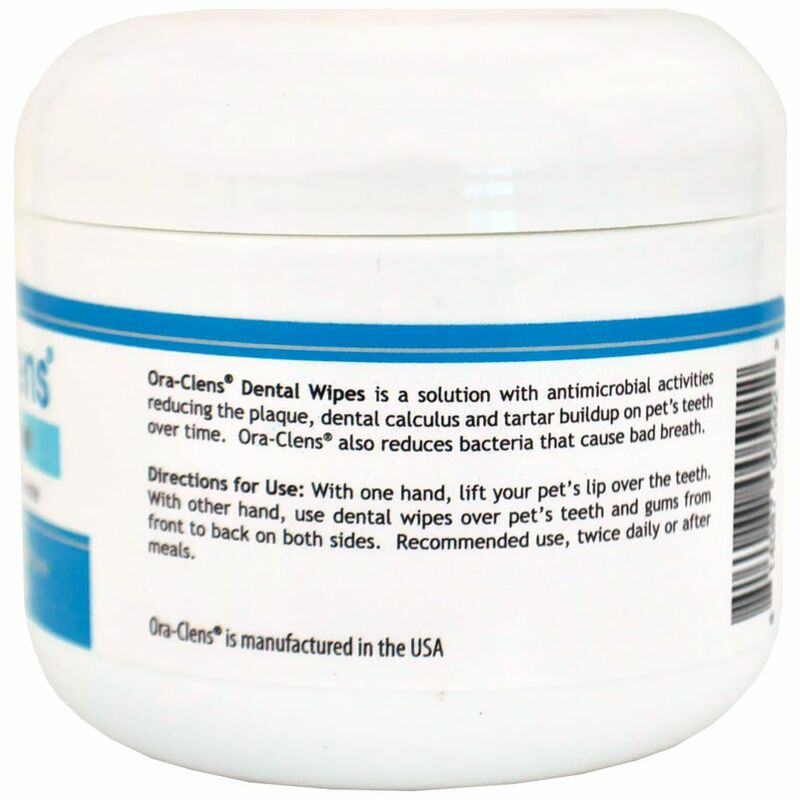 With other hand, use dental wipes over pet's teeth and gums from front to back on both sides. Recommended use, twice daily or after meals. Precautions: Avoid contact with eyes. If eye contact occurs, rinse thoroughly If undue skin irritation develops or increases, discontinue use and consult a veterinarian. WARNINGS: Keep out of reach of children and animals. Use only as directed. Store at room temperature. Do not use: if allergic to chlorhexidine gluconate or any other ingredient. I have a 10 year old Bichon Frise who makes it impossible to get a toothbrush in his mouth. His vet told me that he really needed a dental scaling which I had been trying to avoid despite all signs proving otherwise. He rides in the car with us all the time and his breath would literally make us nauseous and that's not including the visible built up tartar, especially on his molars. Although, he had already gotten it done twice before, It made me sick to my stomach knowing my sweet boy had to undergo anesthesia once again. It's always made me extremely nervous and they always say it takes them longer to recover from it as they get older. He came through it just fine but afterwards I went on a rampage by ordering a new toothbrush, toothpaste..even tartar gel and I vowed that no matter how much he struggled, I would brush his teeth every single day. Mind you, this is coming from someone who has tried EVERYTHING to get my dog to at least tolerate daily brushing. Finger brushes, kid sized brushed, every doggy toothpaste flavor under the sun(C.E.T included)--I've even watched videos on how to introduce the toothbrush slowly then reward. My dog wasn't having it and would act like a possessed demon by thrashing around as if I was torturing him. Needless to say, although I was determined after ordering everything, I couldn't help but feel a bit skeptical. Sure enough, he loved the taste of the toothpaste to my delight and with a glimmer of hope, I gently pulled his lips up to begin brushing annnnnd.....Nope. There he went. At my wits end, I tried the gel which required you to put a bit on your finger and rub directly on the teeth and shockingly, he didn't mind it. In fact, he enjoyed it. I found this puzzling because I had tried using a finger brush and he had hated it just as much as a regular toothbrush. Once again, I got on the internet to search and thought wipes would be a great solution since he obviously didn't mind my fingers in his mouth. 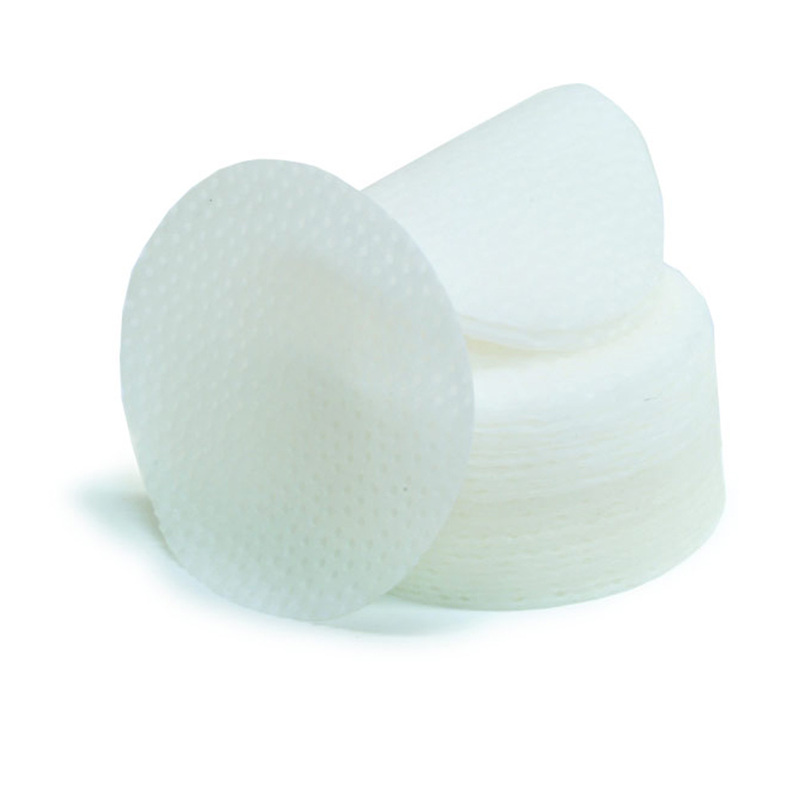 I was excited to read the great reviews on Ora-clens and was eager to begin using them. These wipes went beyond my expectations. My bichon lets me clean each and every one of his teeth without a problem. He doesn't seem to mind the taste at all and although I've only been using it for a month, it's kept the plaque & tartar at bay and his teeth are still pearly white. So, if your dog won't tolerate any form of brushing, this may work for you as it did for me! Cons-You will have to put your fingers in your dogs mouth to get each tooth properly. It doesn't bother me at all, but I know some people may feel a little uncomfortable with that. Works great, easier to use than brushing. The enzymes seem to keep the smelly breath away. ProsEasy to use. Lot of disposable pads. Easier to take with me than a tooth brush and tooth paste when away from the home. No rising necessary.